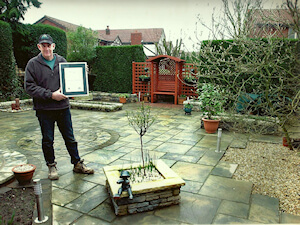 Macclesfield based Landscape Gardeners Paul Gibbons Landscapes Ltd won the prestigious national award ‘Patio of the Year 2003’ recently in Bristol at the annual conference and awards dinner of Tarmac TopPave. Paul was a member of Tarmac TopPaves national elite group who were chosen for their skills, profesionalism and high standards of workmanship across the country. 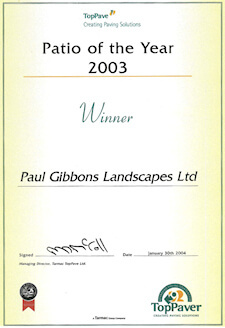 Paul was awarded TopPave ‘Patio of the Year 2003’ and a TopPave ‘Commitment to Quality’ award for Quality, attention to detail, innovation and aesthetics on a patio he constructed last Summer at The Whitfields, Macclesfield.